I came upon a wishing bone. What would you do, if your every wish came true? Do you know how a white rhinoceros takes his tea… where to find the elusive purple tiger… and who wanders in the whiffle bog on a bilgy, bulgy night? The Wishing Bone resonates with whimsical questions, inviting us to think and to dream. This collection of playful poems begs to be read aloud, shared, and savored for its sheer verbal and visual exuberance. He danced a little jig. That he’s a piece of slime. Like flowers in a vase. With scoundrels of his ilk. The gist of their applause. There sat an ancient owl. He muttered with a scowl. Your Honor,” said the bear. Stacked neatly on this chair. He wouldn’t hurt a fly. The proof would make you cry. I’ll have you all to tea. “Not guilty!” cried the jurymen. “Not guilty!” cried the judge. The verdict was quite fair. To see the White Rhinoceros. I told him all my hopes and fears. He looked at me and flicked his ears. I told him all my fears and hopes. He handed me two telescopes. I questioned him about his horn. I left his house at half-past-four. He chuckled as he shut the door. Winner of the Lee Bennett Hopkins Poetry Award for 2004, as the best book of poetry published for children in the United States. The first time I read The Wishing Bone and Other Poems I was struck by its old-timey feel. The watercolor and ink illustrations by Tom Pohrt are reminiscent of Kate Greenaway’s pictures, and the playful, unusual word choice — similar to the work of Edward Lear and Lewis Carroll — will transport readers to another time….Such celebrations of words and their sounds are what poetry is all about. 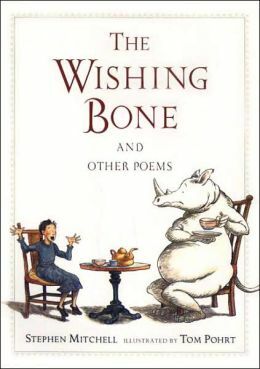 The Wishing Bone could cause a smile to tug at the corners of your mouth and might even cause you to giggle a bit… These poems, which are fun to read aloud, could lead to lively discussions about dreams and wishes. Charming, whimsical illustrations by Tom Pohrt flow throughout. Here’s a lovely piece of bookmaking that combines poems that are both whimsical and thought-provoking with delightful ink-and-watercolor pictures that spill across the pages… Interspersed are metaphysical questions (“How many inches in a year? / What makes a zero disappear?”) to balance the nonsense with ideas to make readers think. The pictures…sparkle and will lead children quickly and easily into the words. Full of humor and imagination, these poems are thoughtful and far-reaching. The language is rich with alliteration, rhyme, similes, and descriptive imagery. Light and fanciful illustrations in ink and watercolor complement the whimsy of the poems. Each reading of The Wishing Bone reveals new layers of its poems, leaving readers with much to ponder. Stephen Mitchell has written a rollicking book of poetry just for kids. The Wishing Bone and Other Poems, illustrated by Tom Pohrt, has the look and feel of a volume from an earlier time. Yet the poetry should hold the attention of modern readers, as most of the pieces embrace both humor and a sense of story.